FREE! And Refreshments will be served! The CUNY School of Medicine, located on the campus of the City College of New York, will be hosting a series of free health information sessions for the Harlem community. We welcome everyone in the community to attend our Mini-Medical School! Mini-Medical School will provide an opportunity for you to explore various health topics, empowering you with the knowledge to actively take part in your healthcare. With no prior educational requirements, this program is open to all members of the Harlem community. Information will be presented in an engaging, easy-to-understand style by health professionals and experts in related fields. 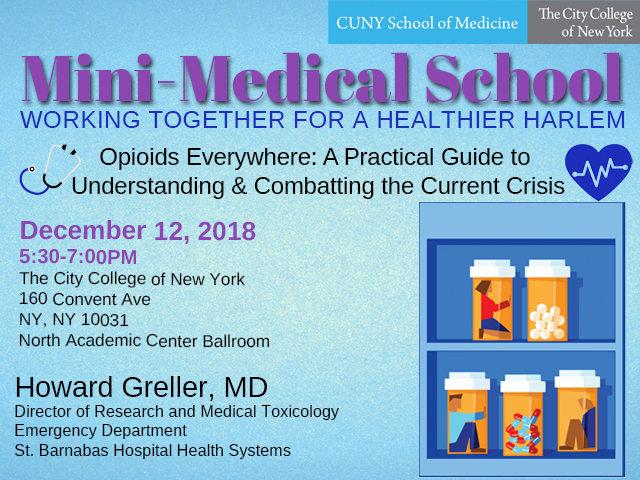 This session will discuss Opioids Everywhere: A Practical Guide to Understanding and Combatting the Current Crisis presented by Dr. Howard Greller, Director of Research and Medical Toxicology Emergency Department at St. Barnabas Hospital Health Systems.